Historic charm, natural beauty and urban convenience; this is Roswell, Georgia. Located in the heart of Atlanta’s metro area, Roswell is Georgia’s eighth largest city, nestled in Northern Fulton County. Over the last two decades, Roswell has seen tremendous population growth due to the accolades it has received for the unique quality of life Roswell residents enjoy. It has been ranked as one of the best places to live as well as one of the safest places to live. For renters searching for an apartment in the greater Atlanta metro area, Roswell is the ideal place to call home. Living in our apartments for rent in Atlanta's Metro area means enjoying an exceptional quality of life and convenience. With Atlanta less than 30 miles away, apartment renters will enjoy an easy commute and convenient highway accessibility. Roswell is also located along the GA 400 corridor, placing Roswell apartment renters near the North Georgia Mountains. In addition, MARTA (Metropolitan Atlanta Rapid Transit Authority) provides bus service to Roswell. Roswell renters also enjoy easy access to the Atlanta Hartsfield International Airport, which is only 30 miles south of Roswell. If you are looking for an apartment to rent in Roswell, no matter what your mode of transit is, getting around is easy and convenient. With an average high in the 80s during the summer and low temperatures barely hitting freezing in the winter, Roswell offers apartment renters a wide variety of outdoor recreation that can be enjoyed year-round. The City of Roswell maintains 18 parks with over 750 acres of active and passive parkland and facilities. Likewise, a branch of the Chattahoochee River National Recreation Area, which is a part of the National Park System, is found in Roswell at Vickery Creek. Living in a Roswell, GA apartment allows renters to enjoy walking or hiking through many of Roswell’s trails, including Old Mill Park, or taking a canoe or kayak ride. Roswell is also a bicycle-friendly city with scenic trails along the Chattahoochee River. The Roswell apartment renter seeking outdoor recreation has numerous options to explore. Experience everything lakeside living has to offer with our Roswell apartments at The Lake House At Martins Landing. Enjoy the lake life by relaxing poolside under one of our cabana’s, or at the lake view deck, or find yourself a spot in our hammock garden. The activities are endless with our playground, tennis court and complimentary kayaks and bikes for use. 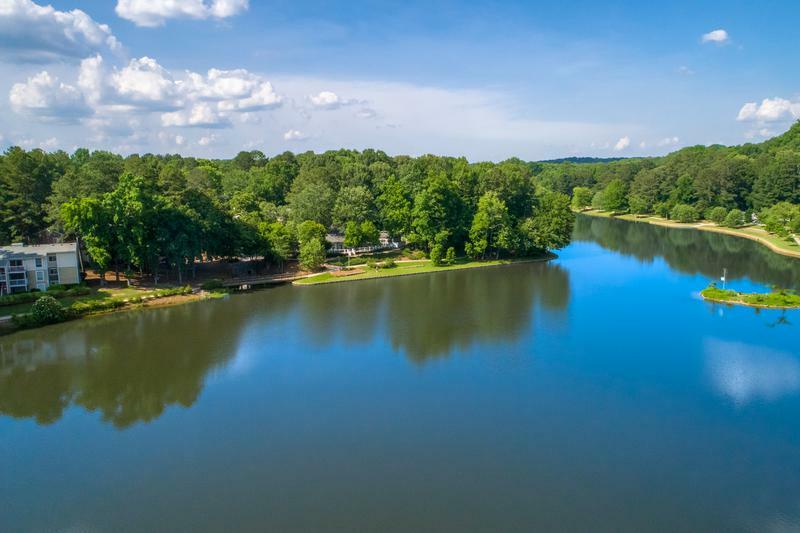 With direct access to the Chattahoochee River recreational area, you’ll always find something to do. Our furry family members have a special spot in our pet-friendly apartments in Roswell. Enjoy our off-leash dog park with agility obstacles or take part in one of our pet events. Pups of all breeds and sizes are welcome. The Lake House At Martins Landing features two, three and four-bedroom apartments ranging from 1,308 to 1,657 square feet. Our apartments are newly remodeled with stainless steel appliances, wood-style flooring and full-size washer and dryers. Along with our many outdoor activities, residents are also offered access to our fitness center, yoga studio and business center. With the most spacious apartments for rent in the area, enjoy life on Martin Lake.